Give a gift of printmaking! 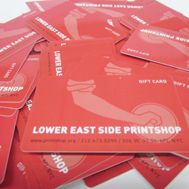 Printshop’s gift cards can be used towards any purchase of our goods and services, including Gift Shop inventory, artwork, classes, studio rental, and contract printing service. Gifts in the amounts of $50, $100, $250, and $500 are available through this website. Any and ALL other amounts can be purchased by visiting the Printshop. Funds can be used incrementally, and cards can be re-filled. This special card was inspired by Beethoven’s Ode to Joy. It is an archival inkjet and screen print with loose confetti, and comes with a matching blue envelope. Printed in a limited edition of 400, it is signed and numbered by the artist. Sebastiaan Bremer was born in The Netherlands in 1970. He moved to New York in 1992. An autodidact, he enrolled in the Free Academy in The Hague in 1989-1991. In 1998 he attended Skowhegan, and in 2001 Art Omi. He was a visiting professor at Virginia Commonwealth University, VA, Cooper Union for the Advancement of Science and Art, NY, and was a resident artist at the Lower East Side Printshop in 2006/2007. His work is in many collections around the world, including the MoMA, LACMA, and the Victoria and Albert Museum. For more information visit www.sebastiaanbremer.com. Reckless Eyeballing is an eleven-color screenprint that measures 5”x 7” closed and comes with a silver envelope. Available for $5, the card is a fundraiser for the Printshop. “Like the surrealists, Villalongo might also believe that exorcising the imaginative faculties of the ‘unconscious mind’ to the attainment of a dream-like state can be ultimately ‘truer’ than, everyday reality. Also, like the Surrealists in the wake of the first World War, Villalongo also believes that a more open and true perception of reality can provoke change—political, social and most importantly, personal” states Franklin Sirmans in a recent exhibition catalogue. Villalongo first collaborated with the Printshop in 2006 when he was awarded a Publishing Residency. He has recently participated in exhibitions at El Museo Del Barrio, James Cohan Gallery, IPCNY, and Exit Art, among others. 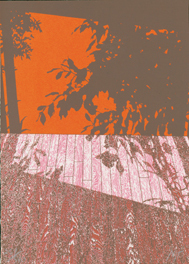 The work created during the Residency was featured in exhibitions here at the Printshop, at the IPCNY, in “Mary Temple, Works on Paper” the Trois Gallery at the Savannah College of Art and Design, Atlanta,GA, and was included in an exhibition at the Contemporary Museum in Baltimore, MD. All sales proceeds from this edition will benefit the Printshop’s programs. Information Retrieval 110 is a five-color waterbased screenprint, 7″ x 5″ closed. It is hand-printed by the Printshop’s printmakers in a limited edition of 540, and signed by the artist. Made as a single-fold card with a blank interior, the print comes with a matching blue envelope. Geraldine Lau is an accomplished New York City artist. She received the Printshop’s Special Editions Fellowship in 2002; the prints created during the Fellowship were featured in exhibitions at IPCNY and the Hoffman Gallery of Contemporary Art. Luncheon Special is a three-color waterbased screenprint, 7″ x 5″ closed. Hand printed in a limited edition of 550, it is signed by the artist. It comes with a matching green envelope. Joanne Greenbaum is an accomplished New York City painter. Greenbaum has shown her work in solo and group exhibitions in the U.S. and internationally. Among her recent accomplishments, she was a resident artist at the Skowhegan School of Painting and Sculpture in 2003; a recipient of the Rockefeller Foundation Residency at Bellagio Study Center in Italy in 2003; a recipient of the Special Editions Fellowship at the Lower East Side Printshop in 2002; a recipient of the John Simon Guggenheim Memorial Foundation Fellowship in 2001; and a recipient of the NYFA Fellowship in Painting in 1996. Printshop T-Shirts are hand-printed on 100% cotton, pre-shrunk, white, short sleeve, scoop neck tees. They are available in sizes S-M-L-XL, with bright red orange on front center. All sales proceeds from the t-shirt sales will benefit the Printshop’s programs. The Printshop’s hats are 100% cotton, orange with a black logo stitched in the front. They are made of soft comfortable cotton, and provide perfect shade. They have adjustment straps in the back for comfortable fit. They were first introduced during the Soft Hat preview party at the Printshop’s new space in December 2004. Only a few are left; get yours today! All sales proceeds from the hat sales will benefit the Printshop’s programs. 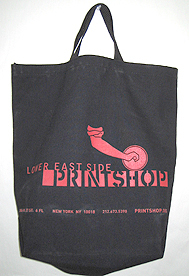 The Printshop’s bag is suitable for art supplies, groceries, or anything else you desperately need with you. It is The Bottle Bag – made of 100% recycled soda, water, and food containers. The fabric is soft and very durable, and helps preserve the environment. It’s large size – 18″w x 17.5″h x 7″g – will fit many, many things. Because of the short 13″ handle, it won’t drag on the floor and is easy to carry. Available in black only with the Printshop’s cool logo on the front. All sales proceeds from the bag sales will benefit the Printshop’s programs.